We have designed the Lush Samba to skate like no other longboard out there. It’s sole purpose is to carve as hard as possible, turning super fast with maximum lean. We have specced a very low angle truck – the Sabre Forged Baseplates are only 38 degrees. 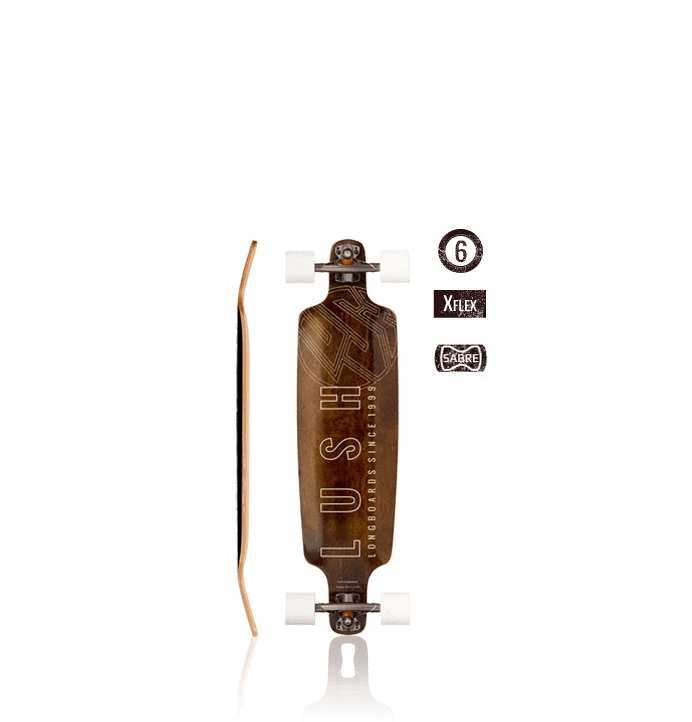 Most longboard trucks are around 50 degrees. 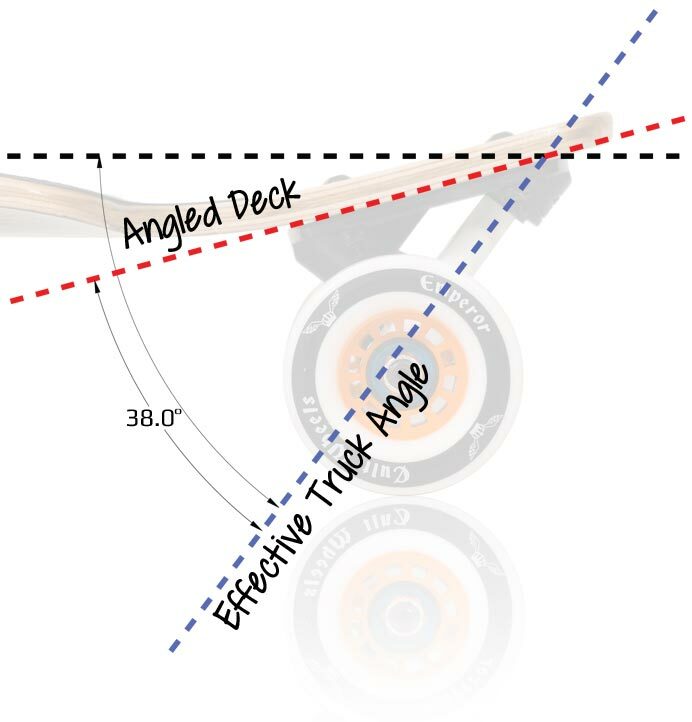 This angle refers to the pivot angle – on a normal board, the steeper the angle, the less you have to lean for the same amount of turn. There’s more on this on the Sabre Trucks Website. The Samba uses very low trucks, mounted on the deck at an angle that brings them close to 50 degrees again. By taking a low angle truck and wedging it back to “normal” again, we end up with a “normal” kingpin angle, but a very angled baseplate. So the way that your feet and body weight interact with the truck changes completly, and helps activate the truck in a very different way as you lean. This board would only work with a very low angle truck – if you see something similar to the Samba with “normal” trucks on, don’t be fooled – it’s not going to have the same Samba magic! The Samba has a custom-shaped cutaway for the Sabre Forged Baseplates, to take advantage of Sabre’s “Drop-Up” system. By doing this we sink the truck into the board, similar to a Drop Through truck mount – however, as the deck is still on top of the baseplate, the truck is still “activated” in the same way as a topmount. Drop-through boards often don’t turn quite as well as topmounts – and we wanted as much turn and lean as possible with the Samba. By using this flushmount system, we can get things as low as possible and keep the same carving feeling. 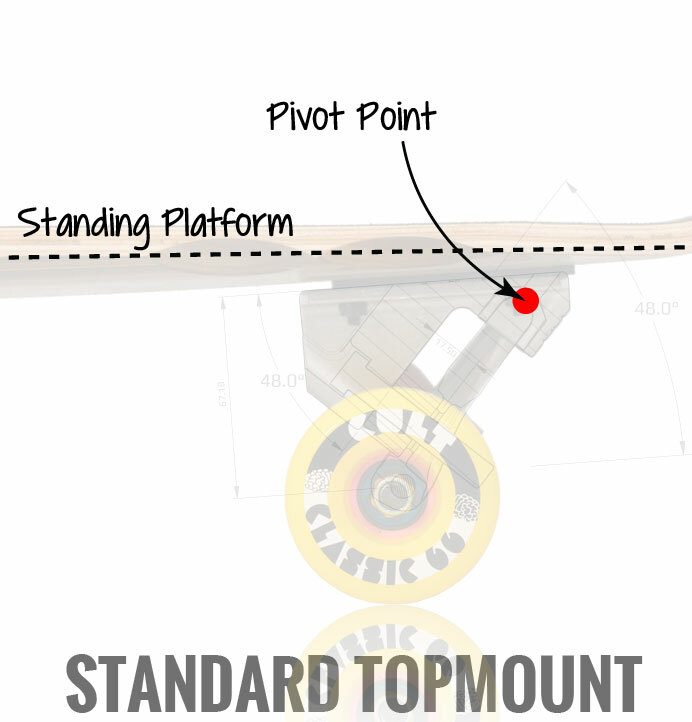 On a regular “topmounted” longboard, the soles of your feet are well above the pivot point of the truck. You are riding on top of the trucks, and as you lean this activates the truck in the usual way. 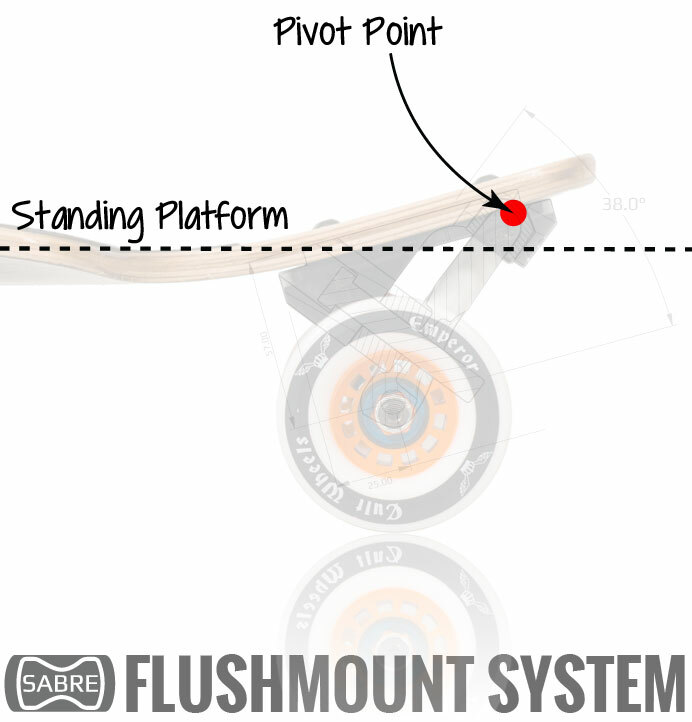 With the Samba, the pivot point is actually higher than the bottom of your feet, and the kinpin stays lower like a topmount. This allows us to have as much leverage over the truck as a regular longboard, but gives us loads more lean and control like a drop-through. This is the heart of why the Samba feels like nothing else out there. It’s a combination of the Angled Truck Mounts, the Low Angled Baseplate, and the Flushmounted Drop-Up all working in concert. 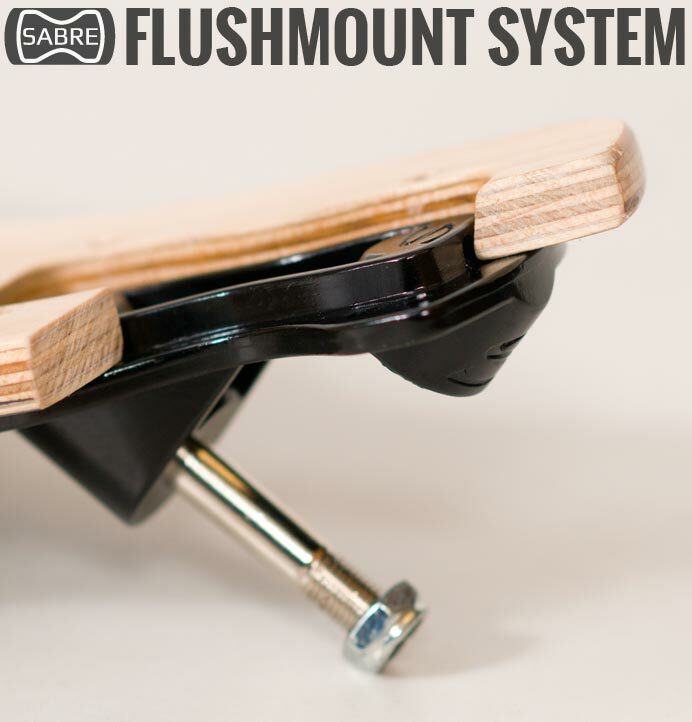 The Sabre Forged Baseplates are intended for Downhill use, and usually come with very hard bushings for a restricted turn – not what we want! So we have used the softest bushings that Sabre make in a “cone” shape. This transforms a normally stable, slack baseplate into a divey, turny, responsive beast! These trucks turn and lean like hell, with minimal resistance as you crank over into super-deep carving turns.